As Nerd Nation Editor Dave Harlequin can attest, I am known for being fair in my reviews of films. As I believe he would also attest, I am not known for being particularly generous in said reviews. Also, I am kind of a stickler, in that I can explain precisely why I like, dislike, or don’t care one way or the other about anything about a film. That said, here’s what I thought of the latest Dwayne “The Rock” Johnson vehicle, RAMPAGE – I dug it. 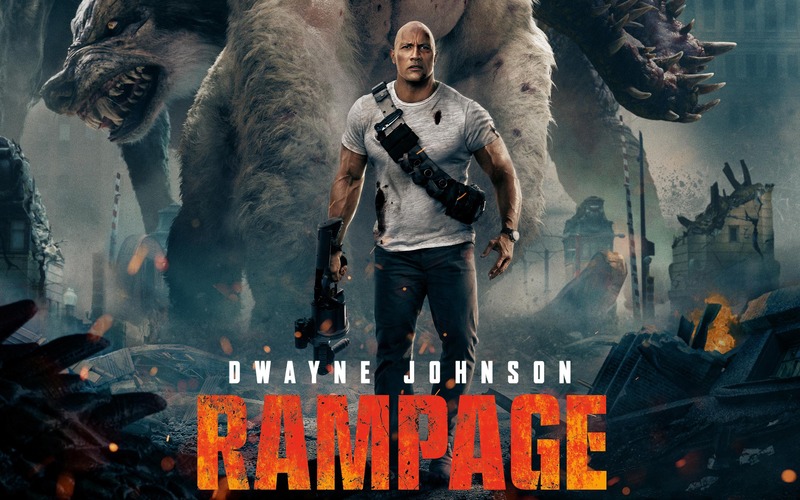 RAMPAGE works, as a number of some might say unlikely films do, because of one key, fundamental thing: It knows exactly what it is and doesn’t try to be anything else, not even a tee-tiny bit. It’s a movie based on a 1986 video game about a bunch of monsters destroying cities and chomping on people. A narrative gauze was created to give it three acts of story and to hold it together, and in that respect it is practically Citizen Kane compared to the likes of 2014’s Godzilla. Also compared to that Godzilla film, another key ingredient was in this film. It is obvious in every frame that people were having fun making it, and a job well done it was, on-screen and behind the scenes. Yes, it’s light, popcorn entertainment, and more than so many films that try really hard but fail to be, it’s fun. As Dave can also attest, that goes a long, long way with me. The script was fairly tight, not much in the way of missed or protracted beats. Money spent on CG is all on the screen and well done. (Nobody can complain about overblown CG in a film about giant monsters marauding the countryside and Chicago, can they? I mean right?) Musically, it wasn’t over-scored, didn’t detract audibly from what was going on. Overall, RAMPAGE said what it was on the box. There’s really very little to complain about, and what little there is is kind of made up for with Jeffrey Dean Morgan. Dwayne Johnson handles the leading man thing commandingly, and Morgan holds his own and pulls the focus in every scene he’s in with him. And he’s not in all that many, really.